A while back, I started wondering why the celebrity media in Vegas wasn't more aggressive, why there is no paparazzi here the way there is in LA and NY. And so, as I am wont to do, I turned my question into a major New York Times piece that appears on Sunday. The piece is already online, so check it out here. Of course, no sooner than we put this piece to bed did something happen to slightly contradict the premise -- or forward its conclusion? See Richard Abowitz's blog item about a pic of Michael Jackson and his kids that made it onto one of the big celeb-news wire services. This Blog In Pig Latin. Or Something. As most extremely vain journalists with too much time on their hands do, I like to Google myself every so often to see where my work is appearing and what people are saying about it. But today I found something that just baffles me. My Cindy Adams posting was reposted on some other blog. It looks like some sort of blog-bot, nothing real and apparently German in origination , except that something odd happened to what I wrote. Some of the words were inexplicably replaced with others. I wrote: Cindy Adams is one of the grande dames of New York gossipland. She's also, so it seems, a total idiot. They turned that into: Cindy Adams is a specific of the grande dames of New York gossipland. She's also, so it seems, a compute idiot. Me: She inexplicably waded into a long blather about Vegas and Macau, behaving as though she alone has unearthed and is breaking this little trend. And the list of errors in her screed are so freaking bizarre that it's a wonder anyone would ever publish her work ever again. Them: She inexplicably waded into a big gibber around Vegas and Macau, behaving as for all that she abandoned has unearthed and is breaking this smidgen trend. And the enter of errors in her screed are so freaking offbeat that it's a reasonableness of anyone would perpetually bruit about her exertion all the time again. Cindy: A 20-minute helicopter ride from Hong Kong or a slightly longer hydrofoil schlep through the South China Sea, this former Portuguese colony was a rathole 20 years ago with a junky casino owned by a man named Stanley Ho. Them: A 20-record eggbeater in from Hong Kong or a degree individual device drag from stem to stern the South China Sea, this bygone Portuguese body was a rathole 20 eld past with a addict cards owned close to a mortals titled Stanley Ho. Me: First off, I am sooooo tired of people thinking they're clever mocking the use of the word "gaming" as a euphenism for gambling as if (a) they believe the gamers think they're fooling anyone and (b) it's something new. Them: First free, I am sooooo whacked of grouping outlook they're intelligent playful the squander of the in the final analysis "recreation" as a euphenism someone is concerned recreation as if (a) they maintain the gamers of they're light anyone and (b) it's something new. Me: OK. So she's bouncing off the recent reports of 2007's Macau revenues. Fine. But wait, there's more! Them: OK. So she's peppy sour the just out reports of 2007's Macau revenues. Fine. But minister to, there's more! Me: Or, for that matter, had even a nominal awareness of Vegas. The Venetian is not some little joint, it's one of the most successful and famous Vegas resorts in our history. Adelson built a steroid-sized Venetian Macao, which opened last summer. And this woman, who "knows" because she's "been there," goofs it up because she evidently MISHEARD it. Them: Or, in return that theme, had unruffled a supposed cognisance of Vegas. The Venetian is not whatever inconsiderable combined, it's joined of the most in the money and prominent Vegas resorts in our history. Adelson shapely a endocrine-fourpenny Venetian Macao, which unsealed eventually summer. And this maid, who "knows" because she's "been there," goofs it up because she manifestly MISHEARD it. Me: She just glossed over the fact that the Chinese economy has been rapidly privatizing and expanding at 8-12 percent a year since the late 1980s, that the industrial sector has exploded, that our "outsourcing" has been Asia's "insourcing." Them: She even-handed glossed concluded the certainty that the Chinese curtness has been before you can say 'Jack Robinson' privatizing and expanding at 8-12 proportionality a assemblage since the example 1980s, that the industrialized facet has exploded, that our "outsourcing" has been Asia's "insourcing." Me: what's the difference between drug lords and casino kingpins? Them: what's the remainder between dope lords and cards kingpins? Cindy: Take them with you to the can, to bed, to the pool, to who cares. Them: Take them with you to the crapper, to bottom, to the gather, to who cares. Other new phrases I love: Squiffy rollers. The lieutenant-large recreation weekend of the assemblage. Shadowy lateral deals. Dilatory present emotive. You know what they got right, though? They didn't alter this line from dear Cindy: "I met him. I was there. I know." I guess that's ignorant arrogance in any language. So how does this happen? Anyone? It turns out, the $185-a-night Alexandria Suite that Miles and I enjoyed/endured early in January is NOT the top of the line for the aging, classic Sahara. 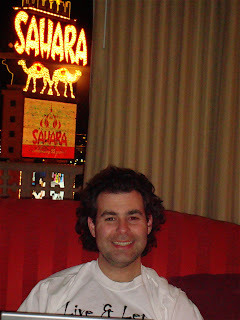 I was contacted this week by the publicist for the Sahara Hotel-Casino who, it turns out, is a reader of this blog and a listener of the podcast. She calls them "very witty and refreshing." (That's so nice, especially since she must've winced at my description of their troublesome elevator.) And she wanted me to know that there are penthouse suites at the Sahara that are "not listed online." She enclosed this photo which, I agree, is very pretty and very unlike the room we had last time out. Intrigued? So was I. She wrote back to say that their three 2,000-square-foot suites are called the Ambassador, the Presidential and the Penthouse. "They’re very quirky and retro-glam, with wraparound patios overlooking the Strip. 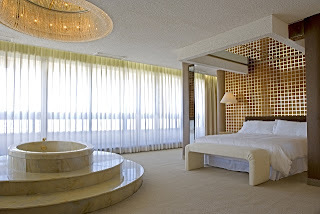 And, of course, the requisite hot tub in the master bedroom." Of course! 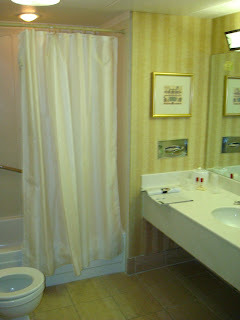 She even threw in the tidbit that Elvis and Ann Margret stayed in the Presidential Suite when filming "Viva Las Vegas." I really should've held onto that for a weekly trivia question, but I couldn't help it. The publicist said these are aren’t available online because "they’re usually in high demand and booked up by groups or casino players. But anyone can call Sahara room reservations and request one of them! The rates are very affordable and the spaces are huge." Now I dunno. A Bellagio penthouse for Thursday night will run $950. The smallest SkyLofts at MGM Grand can be had for $800 next Thursday night. (They were full-up this week.) Given the amenities and elegance of each of those, not to mention the total packages that are those resorts, I think the Sahara's prices here seem a bit steep. That said, I did take the opportunity, also, to find out the future of the Sahara. Or when we'll learn more about the future of the Sahara. The publicist said they're "developing plans for a major renovation, slated to begin this year" that will be completed in 2010. No word on whether that'll involve an implosion. Holy Crap. Cindy Adams Is A Disaster. Cindy Adams is one of the grande dames of New York gossipland. She's also, so it seems, a total idiot. Monday's New York Post column proves this. She inexplicably waded into a long blather about Vegas and Macau, behaving as though she alone has unearthed and is breaking this little trend. And the list of errors in her screed are so freaking bizarre that it's a wonder anyone would ever publish her work ever again. To wit...let's take it apart, shall we? She's in red. China - which practically owns our paper, our finance, our debt, our businesses, our manufacturing - also owns all our money. Where's this planet's biggest gaming (the new politically correct word) operation? Macao. A 20-minute helicopter ride from Hong Kong or a slightly longer hydrofoil schlep through the South China Sea, this former Portuguese colony was a rathole 20 years ago with a junky casino owned by a man named Stanley Ho. I met him. I was there. I know. First off, I am sooooo tired of people thinking they're clever mocking the use of the word "gaming" as a euphenism for gambling as if (a) they believe the gamers think they're fooling anyone and (b) it's something new. The word "gaming" has been in use to refer to playing games of chance for more than a century, according to one of UNLV prof Dave Schwartz' books. And, also, it's odd that she's refer to Ho as owning "a" junky casino. He actually owned several. But, hey, she knows. She was there. Mmmhmm. That's nitpicking, though, and you'll love the next bits. Fast-forward. It's now 28 multimillion-buck five-star hotels like the Phoenician, Wynn's Macao, with all the bells and whistles - butlers, famous chef restaurants, shops such as Chanel, Dior, Vuitton. Five new properties in 14 months. Unless I'm insane -- and the MacauTripping.Com folks can correct me -- there are absolutely NOT 28 five-star hotels on Macau. I mean, I don't think anyone's actually RATED any of them, but even if we were being overly exuberant and optimistic, TWENTY EIGHT??? Frankly, I'd be surprised if there were even 28 hotels. Also, I thought as I read this, who owns the Phoenician? Maybe it's something I'd not noticed before? We get back to that. Hang tight. By 2010, visitors will number 35 million per year. Koreans, Japanese, Chinese, Malayans, Indians, Indonesians, Thais, Singaporeans, Cambodians, Laotians, 1.4 billion people within 31/2 hours flying time, and it's a gambling culture. Baccarat, not craps, the main game. They are very focussed. Unlike America, Asia has no gambling stigma. Not so much skill as karma, luck and personal superstitions. They bet millions. Last year's revenues - in US bucks - $10.5 bil. OK. So she's bouncing off the recent reports of 2007's Macau revenues. Fine. But wait, there's more! They don't do Vegas. Reason? Airplanes don't allow smoking. To import these "whales," or high rollers, on the docket now is a charter that lets them smoke - and gamble - all the way over. Jurisdiction over the skies is being worked out via video camera that starts at takeoff, so all bets, losses and wins are tallied over recorded airspace. Think about this logically: The only reason why Asian whales would avoid Vegas on account of non-smoking flights would be if they were flying commercial airlines, and why would millionaire bettors do that? They either take their own private jets or the fly the DOZENS of private planes (usually not charter as the resort companies own these vessels) that the big Vegas guys send over. As for gaming in the skies, you honestly believe that any company with a Nevada gaming license would risk participating in unsanction gaming as she describes? It's an interesting idea and I imagine someone somewhere is trying to figure out how to make it work, but since nothing's ever come before the Nevada Gaming Control Board, it sounds like a 007 fantasy to me. And let it be known, whoever steers these high rollers gets a piece of the action. And let it be known, if a favored player loses big, like millions big, there's a giveback. Nobody's saying how much. Take a shot at 5 percent. This one I dunno. Do publicly traded companies really make shady side deals with customers of this type? I'm dubious. Steve Wynn is learning to speak Chinese. Yeah, he mentioned this in my Newsweek piece way back when and tried some words out at a shareholder event, I think, but my impression from chatting with him more recently is that he's dabbling more than "learning." The Phoenician's Sheldon Adelson is building additional hotels. SCREECH!!!!!!!!! This is where Cindy flies off the rails. The "Phoenician" turns out to be ... the "Venetian." AND NOBODY FACTCHECKED HER. Or, for that matter, had even a nominal awareness of Vegas. The Venetian is not some little joint, it's one of the most successful and famous Vegas resorts in our history. Adelson built a steroid-sized Venetian Macao, which opened last summer. And this woman, who "knows" because she's "been there," goofs it up because she evidently MISHEARD it. HOLY MOTHER OF GOD! Whew. OK. I'm better now. Moving on. MGM is putting up condos. So, these Chinese, who were previously poor Communists, where they getting all this bread? Either they must have really large piggy banks, or some of these piggies know something about the drug culture. Yes, women pengyou. (That's Mandarin for "my friend.") She just essentially called the entire emerging middle class of China -- a burgeoning group that represents one of the most significant creations of new wealth in modern history -- a drug racket. She just glossed over the fact that the Chinese economy has been rapidly privatizing and expanding at 8-12 percent a year since the late 1980s, that the industrial sector has exploded, that our "outsourcing" has been Asia's "insourcing." No, forget the sophisticated geopolitical and geofinancial explanations for China's growth and diversification. In Cindy Adams' &^**(#-up world, they're all just DRUG LORDS. Oh, and Steve Wynn, Sheldon Adelson and the gang are flying these creeps around the world on private planes because, you know, what's the difference between drug lords and casino kingpins? These guys who run the operation let no green grow under their feet. They're now organizing portable slots. Take them with you to the can, to bed, to the pool, to who cares. Gamble online. Sigh. In Vegas, there is expected to be some portable gaming devices, but not in Macau. And it's been slow going moving this along, seeing how I wrote nearly two years ago for Wired that Cantor Gaming was about to start a trial run at the Venetian Las Vegas (or is it Phoenician, Cin?) and it still hasn't happened. The Venetian folks seem indifferent to whether it ever actually does, the MGM Mirage folks have said they don't think it's a necessary amenity. And the Nevada gaming law requires all gambling on whatever devices are to come take place in PUBLIC places. Which eliminates the can or the bed. And you're worrying about your mortgage? With morons like you, Cindy Adams, covering gaming matters like this? You kidding me? I'll never go broke. BREAKING: Mystere's Days Are Numbered! It's just a matter of what that number is and that I don't know. However, a key source has informed me of the Cirque du Soleil-MGM Mirage plan for Vegas. In it, there is a plan for one new Cirque show every year for the next four years. One of those four happens to be planned to come to the Treasure Island, which means Mystere will go bye-bye. Mystere just renewed their contract for two years, which makes sense seeing how the first two shows in that plan would be the Criss Angel one at Luxor this summer and the Elvis one next year at CityCenter. The big speculation should be which other property would get the fourth new show in the plan. Mandalay Bay is supposed to lose Mamma Mia! in early 2009, but MGM Mirage folks keep telling me they don't want Cirque there and, anyhow, would they leave that room unassigned for two years? That's a lot of Liza Minnelli concerts! The only other properties they might consider would be Monte Carlo and Excalibur, and I suspect Cirque is too high-brow for the X. Lance Burton, though, ends his contract in 2009, I think. And something tells me that place could use a new lease on life. 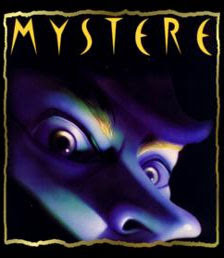 Anyhow, Mystere is now locked in to complete 18 years at least, and that is an astounding success that is unprecedented for Vegas. That is, until "O" eclipses it. Because, you know, "O" is forever. I'm also told that the Mystere cast has been informed that the show's mortality has been vaguely decided. But you, of course, heard it right here first. Since I'm sure you've been worried, I just got a little piece of info that I guess I should've known but didn't. In chatting with Alan Feldman, the MGM Mirage spokesman and veep, he explained that it's difficult to assess how much the Monte Carlo fire and closure will cost per day because they have "business interruption insurance." Apparently, they also had that in 2004 when the Bellagio was shut down for four days because of an Easter-weekend blackout. I'd love to find out what such insurance costs and covers and who provides it to businesses that lose MILLIONS a day when they're closed. Also, I can't think of another resort company in Vegas that's ever had to employ it. The MGM Mirage, after all, had to shut down the Bellagio and the Monte Carlo because of freak events. What other resorts have had such misfortune? Did they shut down the MGM Grand casino when they had that riot after the Tyson fight a while back? That, too, was an MGM Mirage property, unless it happened before 2000. I wonder if all those casinos on the Gulf Coast were covered -- and up to how much? -- after Hurricane Katrina. Feldman also says there's no telling yet when the place would reopen, but he and I will speak later tonight after he goes to a briefing for a SPECIAL EDITION OF THE STRIP that I'm going to try to post much later tonight. I'm in a Starbucks in Manhattan today, so I had to bite the bullet and pay T-Mobile for my Web access. But what really surprised me was that I just went to look at something in iTunes and I see that iTunes and this Starbucks are in some sort of freaky cahoots because the banner across the top indicates the name of the song playing right this second in this cafe. I mean, I can't hear it over the din of chatter, but I'll surely take their word for it. Do you think that all Starbucks are playing the same music everywhere at the same time? OK, OK. I'm sure it's pretty simple. But it's also kind of stunning. I'm sitting in a cafe, I like the song and iTunes wants to sell it to me. Does Starbucks or T-Mobile get a kickback if I buy? And, also, how long have they been doing this? Also, how come nobody else's iTunes playlists are available for me to browse? There are about 2,500 people here with laptops; surely someone else has iTunes? I always love looking at what other people have. Did they stop letting you do that at some point? Live From, Uh, New York? How does one cover a fire in a city 2,000 miles away? Well, if the fire turns out to be less than a holocaust (look it up - a "holocaust" originally meant a devastating fire), it's not that hard. Also, if you're able to tap into a huge network of Vegas people from the blogs and list-servs, it's also doable. Not ideal, but doable. Here's what I ended up with. I got quite a ribbing from my family for the idea that I could write a piece in this manner. As I said, it's not how I'd normally do it. But in a pinch -- evidently the Times simply could not find another reporter in Vegas -- it'll do. My Las Vegas Weekly column will discuss this further, but there was something else about this experience. Since I wasn't there, I was glued to the TV. And, while I was thrilled to see that KVBC logo in the corner indicating that CNN was using Miles' TV station's footage, it was just sickening to realize that even in its hour of trauma, Vegas just isn't taken seriously. There I was, near tears watching the apparent destruction of a major structure and worrying about the pandemonium of thousands of guests and employees having to get out. I assumed that there were tourists in the upper floors who were trapped and possibly dead. That it all worked out OK does not minimize what it looked and felt like in the beginning of the crisis. But the folks on cable news? They thought the fire was entertaining. One CNN reporter actually wondered jokingly in the earliest stages whether the Monte Carlo buffet comp he’d recently received in the mail was still valid. FOX News Channel, which carried every O.J. Simpson press conference live, didn’t bother to pick up its local affiliate’s feed from the briefing by Las Vegas Fire Chief Steven Smith. And, yes, some bozoette on one of those stations – can’t recall which – really thought she was clever muttering, “Like Paris Hilton would say, that’s hot!” Can you imagine such irreverence if this had been the Sears Tower? Just as amazing was how quickly the story died the minute it turned out that no humans had. Were I not on vacation, I would be pushing editors to let me do the obvious follow-up: A 32-story building containing 5,000 or so people caught major fire and everyone got out calmly. And alive. Imagine that. OK, OK. It's been several weeks and, even with all the news going on around here, I've really no excuse for not getting this up a little bit sooner. Miles had often said "The Strip" that he wanted to try "the nicest thing they have at the Sahara." So, on the Saturday night after his birthday in early January, I shelled out a whopping $185 for this palatial suite. $185 was actually a bit of a deal because that weekend in January is especially dead in Vegas, but scouring the Sahara calendar I found that the most his suite in the Alexandria Tower every costs is about $400 during -- wait for it -- NASCAR Week in March. Poifect! Anyhow, aside from the fact that the elevator stalled and went dark for about a minute somewhere around the 4th floor when I was first heading up, the stay was very nice. Here is the view from the hall outside the bathroom from the bedroom. Yes, that's me in my native pose, laying in my knock-around clothes with my laptop. One of the coolest parts was that each suite has an outdoor balcony. 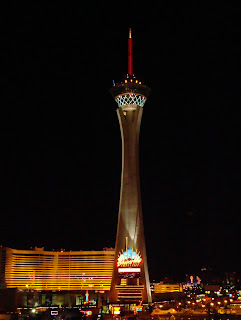 Since we were on the north end, though, that view was of the Stratosphere and such. Our conclusion was that this was a pretty good value, especially right off the Monofail line, for the money. We turned it into the Jan. 17 Top Secret Tourist Tip of the Week on "The Strip," and Miles offers more of his own thoughts in that discussion, which is at the end of that episode as all TSTTotW are. Hear that here. There was a wetbar and a fridge, too, although no minibar offerings. (Sorry but I left the photography to Mr. Smith and he's not as exhaustive in his coverage as I am!) And, despite the indication on the Sahara site that each room "comes with" wireless Internet, it's not free. That might've been a nice amenity, but operable elevators are also kind of fun.